After the wedding vows have taken place newlyweds have a lot to consider when combining their lives. They have much to do, much to buy, and a limited window of time in which to set up their new lives. This is your window of opportunity to help fulfill their many needs. In fact the total marriage market worth is estimated at over $270 billion in annual spending. Young families are in the market for a full range of goods and services within a short period of time after having a baby. As in any major life change, new parents are in a prime buying mode. It is important as a marketer to reach these lucrative consumers at the right time. 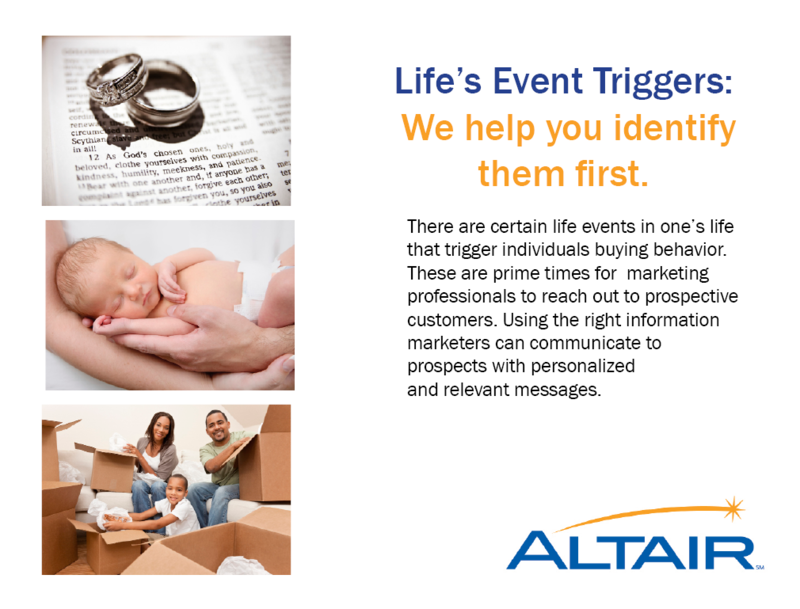 Altair’s New Parent triggers are able to identify parents who have recently had a child. Financial institutions often do not effectively reach those who may need retirement solutions. According to Deloitte’s Retirement Survey, a majority of Americans — 58 percent — do not have a formal retirement savings and income plan in place. It is vital to reach individuals who can cash-out their 401k without penalty, retire early, and those individuals going into full retirement before they reach these age milestones. Newly divorced individuals are about to review all aspects of their life. This is a time they make key purchasing decisions that will impact their life moving forward. It’s an underserved consumer audience that offers infinite opportunities. Reach these men and women just as their newly single status becomes official. Nearly one in five consumers move every year. These highly profitable markets create expenditures totaling more than $170 billion annually and are 5 times more likely to become your long-term customer if you reach them first. Altair specializes in compiling and distributing mover data to ensure that you are the first to market your products and services. The average annual price for undergraduate tuition, fees, room, and board is $16,789 at a public 4-year institution. During this stage of life, parents are looking for finances to prolong their child’s education. Reaching these parents before their child’s graduation date is crucial. The children have finally left the house—now what? With fewer mouths to feed many empty nesters have more disposable income. On average, they have between $150,000 and $250,000 of investments to manage. To earn their repeat business, time your marketing campaign to coincide with this important later life stage. To receive Altair’s Trigger EBook contact us at asales@altairci.com. This entry was posted in Bank Marketing, Banking, Banking Blogs, Consumer Finance, Credit Union Marketing, Credit Unions, Financial Marketing, Financial Marketing Blogs and tagged Business Intelligence, Customer Acquisition, Customer Insights, Customer Retention, Triggers. Bookmark the permalink.